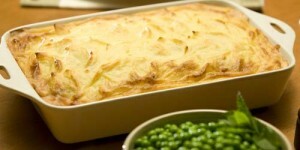 Topping: Cook potatoes in boiling salted water until tender. Drain and mash with milk and half the cheese. Season with salt and pepper if wished. Brown lamb mince in a dash of oil in a hot frying pan. Keep the temperature high so the meat browns and does not stew. This is best done in 2 batches. Set aside. Gently pan-fry the onion and parsnip in a little oil until tender. Stir in the flour and cook until frothy, gradually add the stock, stirring constantly until sauce thickens. Return the meat to the pan with the chutney and rosemary and season with salt and pepper. Turn into a large lasagna-style dish and cover with the mashed potatoes. Sprinkle with a little extra grated cheese if wished.